Worries are many and they all seem to crowd in around bill time, don't they. 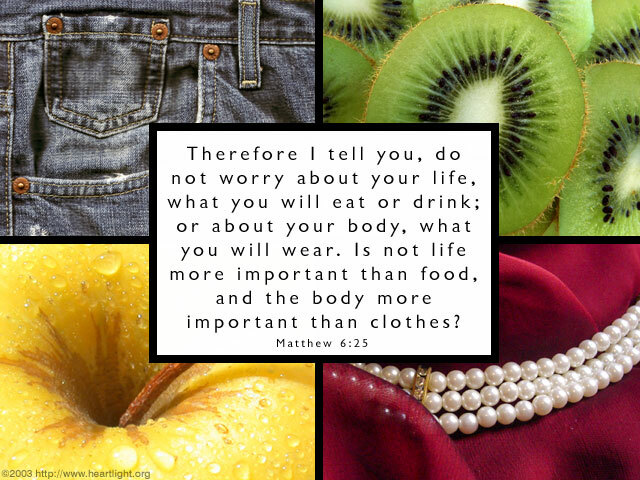 Jesus reminded us that life is more than food or clothes. The real question is whether we can live like life is more than food and clothing. We get deceived so easily, like Esau who sold his birthright for a bowl of soup. Let's not sell out what is precious for the allure of what will most likely end in difficulty and entanglements or at the very least doesn't have eternal value. Generous Father, banish fear and selfishness from my heart. I know you have already provided the most incredible gift of all time. Please help me pursue you and your will and not the things that choke out your presence in my life. In Jesus' name I pray. Amen.